The Google autocomplete function is a funny tool. You can type in things like "what does * smell like" and some of the most insane result come up in the drop-down bar. These results are actually the most popular search items on Google. That means someone, somewhere not too far from you, has been looking this stuff up. Google decided that it would be a fun little experiment to collate all of this data and tally up what each country searched for the most. Our obsession with material wealth is a big deal in the modern world, with mass consumerism impacting our environment in very real and concerning ways. Google grabbed the most popular items that we search the monetary cost of on the internet and released a map so we can all see what countries are interested in what things. To ease you into this daunting prospect, here is Australia and New Zealand. 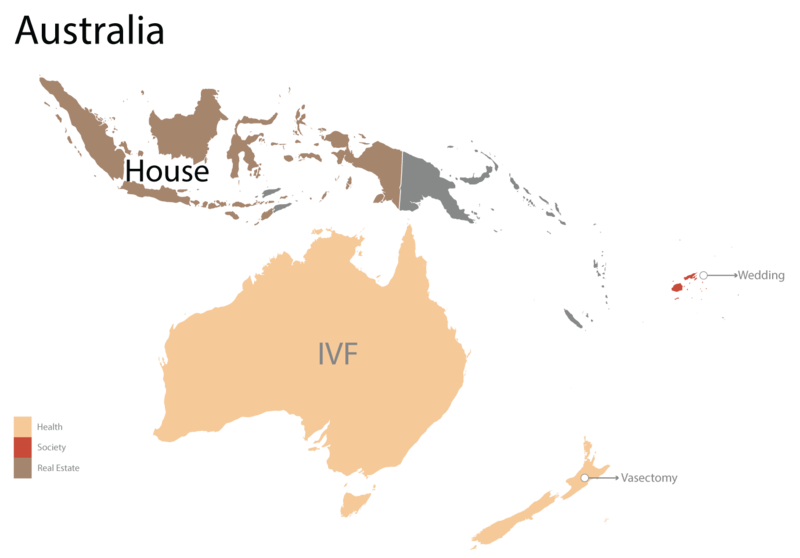 Not too sure why NZ is particularly interested in vasectomies… Moving on. The point I'm making here is that this map blatantly shows us how concerned we are with material wealth. 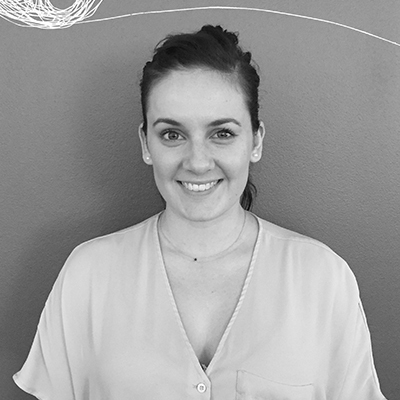 While there are many countries that have legitimate search inquiries and non-threatening purchase preferences to the environment, continents like Europe and Asia show some concerning results. 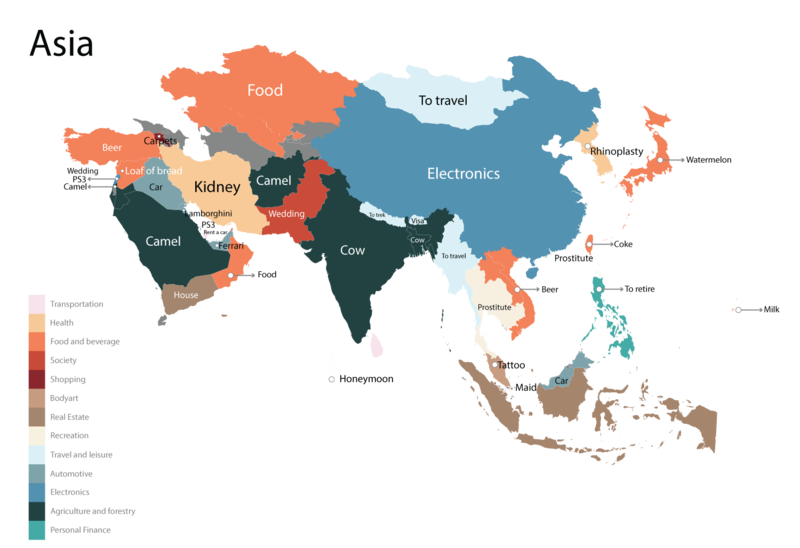 Asia's colour palette seems to cover food and beverage, and electronic goods. 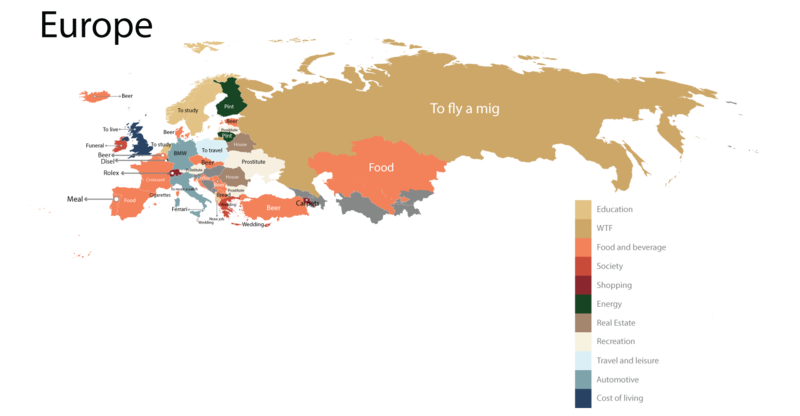 Europe is a mix of education, food and beverage, and automotive purchases. For those of you who don't know, "flying a mig" in Russia is to fly a fighter aircraft. 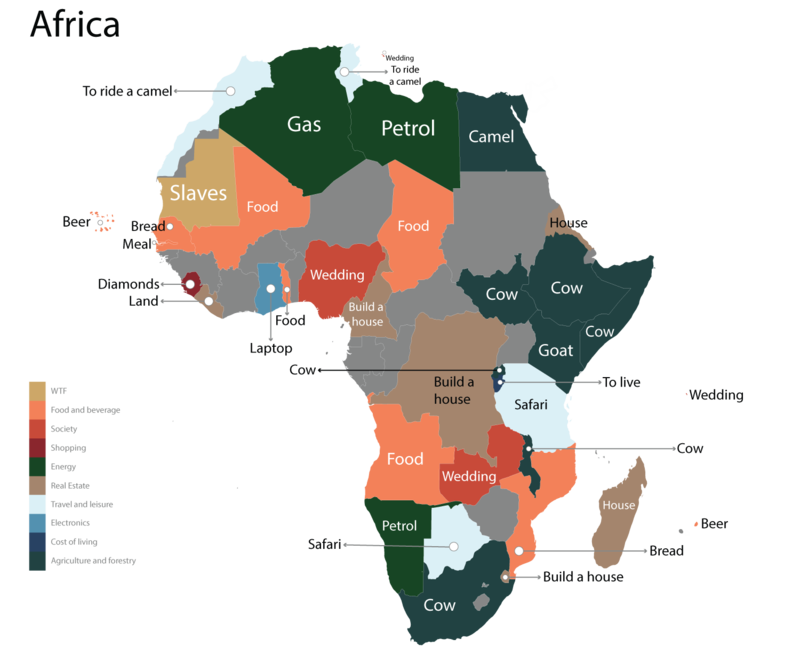 The African continent is an interesting sight, with 'cow' and 'petrol' catching my eye the most. It seems that they are more concerned with the necessities of life, rather than the material things. However, one that sticks out is Sierra Leone, with its interest in the cost of diamonds. There is also a concerning interest in slave purchases in Mauritania. Seeing these searches gives us an insight into cultural differences and similarities. More to the point, it highlights what is most concerning to a country in terms of how it spends its money. Imagine if this money was channeled toward good causes like providing aid to Nepal after the devastating earthquakes, or building sustainable facilities for poverty stricken third world communities? We know that there are plenty of people in the world that donate and do so happily, but we're hoping that over the years this map will change, and the population of countries will be more concerned with purchasing sustainable energy for their homes, or donating their money to good causes, instead of furthering their material wealth.